Add fun to your kid's mealtime by using this alluring spoon and fork set. 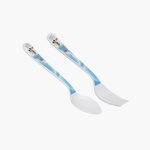 Sporting a Mickey Mouse print, this set looks appealing and has smooth edges to feed your baby safely. The long stem is designed to provide a great grip and help you teach your baby eating etiquettes.